The Chinese Cheater Bag is a lightweight and adjustable shooting bag that will lock your rifle in position on a barricade faster than Rosie O'Donnell can make an ethnic slur against Asian people on live TV. We'd never do that, of course. What dumbass would put us on live TV anyway? 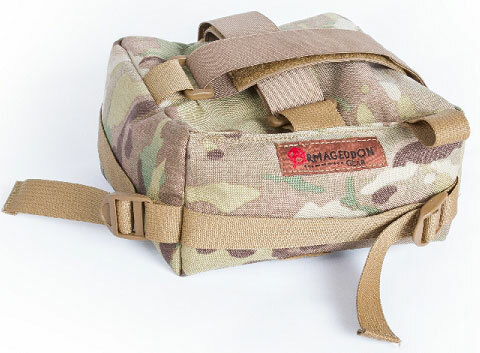 The adjustable webbing straps allow you to increase or decrease the firmness of the bag while the elastic top straps attach the Bag to your rifle or even your body part of choice. The Chinese Cheater Bag is slightly rectangular to give you two dimensions and mounting positions. Inspired by our buddy Kenny Lin, a genuine Chinese-American and all-around good guy, the Chinese Cheater Bag is a great barricade bag, but it's also the most versatile all-around lightweight shooting-support bag available. Dimensions: 6.5" x 8.5" x 4"